Dutch painter. He was the son of a well-to-do Mennonite cloth merchant in Amsterdam. He served his apprenticeship there among the artists now called the Pre-Rembrandtists. After his marriage in 1620, commemorated by the poet Joost van den Vondel (1587-1639), he settled in Leeuwarden, his wife s native city, where he became a preacher in the Mennonite community and worked primarily as a painter. He was also active as an art dealer, as is known from his estate inventory, which records transactions in Amsterdam with the Mennonite art dealer and patron of Rembrandt, Hendrick van Uylenburgh. Two of Jacobsz. s pupils were Govaert Flinck and Jacob Backer. 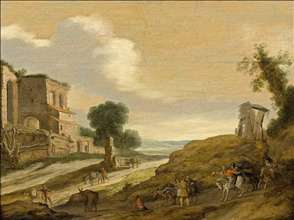 His son, the painter Abraham van den Tempel probably also studied with him before becoming Backer s pupil c. 1642-46. See more details about "Joseph's Brothers on the Road from Egypt"